Former cyclist Lance Armstrong is planning to return to competitive sport as a swimmer. 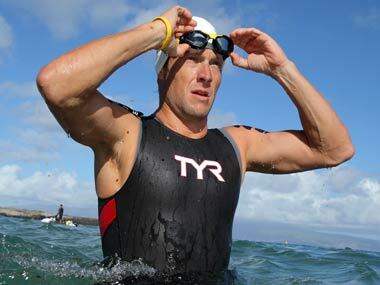 Lance Armstrong, 41, has entered the Masters South Central Zone Swimming Championships in Texas this weekend. The sportsman is able to compete as US Masters Swimming events are not subject to USA or World Anti-Doping Agency codes. Lance Armstrong was stripped of his seven Tour de France titles after deciding not to defend doping charges filed against him in August 2012. He is scheduled to compete in freestyle races over 500 yards, 1,000 yards and 1,650 yards at the event held in his home city of Austin. Lance Armstrong will compete with swimmers his own age or older. His first race, the 1,650 yards freestyle, takes place on Friday. US Masters Swimming executive director Rob Butcher said he had not received any objections to Lance Armstrong competing in the event. “The purpose of our organisation is to encourage adults to swim,” Rob Butcher told the Austin American-Statesman newspaper. Lance Armstrong was charged by the US Anti-Doping Agency (USADA) in June 2012 with using performance-enhancing drugs. The cyclist filed a lawsuit against the organisation the following month, accusing it of “corrupt inducements” to other cyclists to testify against him. However, Lance Armstrong then announced he would not fight the charges and was given a life ban by USADA. In January, Lance Armstrong confessed to taking performance-enhancing drugs during all seven of his Tour de France wins between 1999 and 2005 in a television interview with Oprah Winfrey.